Mercure Hotel Halle Leipzig. Book now! Non-Smoking! 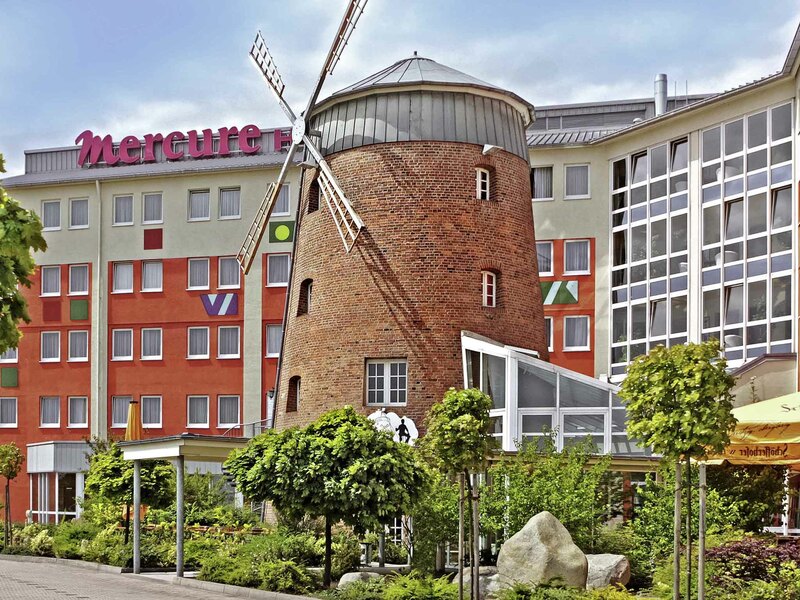 The 4-star Mercure Hotel Halle-Leipzig has great transport links, located on the outskirts of the trade city of Halle and close to the trade fair city of Leipzig. Around half of the 134 non-smoking rooms are air conditioned. The meeting area at our CCH-ce rtified hotel offers eight rooms for up to 300 people. Our real attractions is the bar housed in a mill that is over 100 years old. The hotel is 4.4 miles from the main train station, 9.3 miles from Halle-Leipzig Airport and 0.6 miles from the A14. Only a few miles separate the old university city of Leipzig from the industrial base of Halle. The two cities, together with several smaller places in the states of Saxony and Saxony-Anhalt, form the densely populated region of Halle-Leipzig. Whether you are planning a meeting, seminar or conference or wish to hold a private function, the event area at our VDR-certified Mercure Halle-Leipzig is ideal for both your professional business eventand your party or banquet for up to 150 people. The 8 rooms, some of which can be combined, are air conditioned and feature modern event technology including WIFI. At the 4-star Mercure Hotel Halle-Leipzig, you can choose from Standard and Superior Rooms, a Suite with water bed and the exclusive Mühlen Suite over 2 floors. Half of the 134 non-smoking rooms are air conditioned andhave WIFI. Your child aged up to 12 years can stay in your room for free and enjoy breakfast at no extra cost. You can obtain a second room for your children at a 50% discount if available. Your pet is welcome (EUR 5/night). Our Standard Rooms are ideally suited to your needs. Along with a TV and telephone, the rooms include a high-quality bed, comfortable seating and functional desk space with WIFI. More room to relax! Enjoy the peaceful location in our Superior Rooms featuring high-quality beds, comfortable seating and functional desk space with WIFI access. You will receive a free bottle of water on arrival. Indulge in selected regional specialties in our spacious restaurant "Mühlenstein" from 6pm until 10pm. You can enjoy a delicious breakfast here in the morning, which we are happy to serve you on the terrace. Cozy and sociable is how we define our "Mühlenbar". Come and have a chat with other guests while enjoying your favorite tipple and tasty snacks anytime between 6pm and 1am. You can also surf the net using Wi-Fi. Location excellent for stopover, but also far away from either Leipzig or Halle. Nicely decorated clean rooms. Dinner in the evening was very nice indeed. The wine list has several local wines from the area. Breakfast was alo good. The hotel though was mostly occupied by touring bus persons. The reception was very friendly in contrast to the restaurant. Very nice hotel, good restaurant with good meals, very good service over all. Comfortable room, wide bed, although the pillows could have been better or at least I could have done with one more pillow. Beds to hard and pillows much to soft, nice resturants at least. Situated in an industrial shopping center area is a bit odd and you realy need your car, close to the motorway is good. Staff was very friendly and helpful. Stop over on business trip - very good place easy to reach from motorway - late arrival and still you can have a meal and a drink - good internet connection - very nice room with all you need for a comfort stay. excellent service, good beds and excellent breakfeast, the location is not the best. all inn all this hotel is good value too the Price. we had a very good weekend at this hotel. we will come back Again another time. An excellent haven close to the aurobahn for an overnight stop. Very adequate room on 3rd floor, but currently lacking a minibar, but it was said that the hotel intends to fit minibars shortly. Reasonably priced restaurant for evening meal and very acceptable breakfast buffet. The bar in the windmill around which the hotel is built is an interesting novelty. However, as in many hotels pillows are a problem, especially when only one is provided. Good sized, comfortable room, friendly staff and excellent breakfast. Hotel a bit dated in places but still pleasant. Close to A14 and shopping centre but not a great location if you want to do something in the evening. Wellness area was ok. The hotel is in a great location ajacent to the autobahn, and very near a regional shopping center. There's a windmill that is part of the calling card of the property; and it's a kind of unique feature to the place. The greeting and check in are prompt and professional, all my staff contacts were very positive. In my personal experience this Mercure property needs an update soon. While it is still a comfortable place to stay, it's lobby and dining room are dark and not in the sense of ambience. The room in my assignment was clean, the furniture aged, a small tube TV on the desk, although to their credit internet speed was solid and stable. Carpets in my room were well stained, the bathroom very very clean, but dated and quite small. The dining room is not open in the evening, so an evening meal is taken at the bar, but they are bar tables, so it's quite small. Breakfast buffet while well set is not inexpensive. Hallways are on some kind of sensor that leaves the lights off until they detect motion, but they don't all come on, so it can be a little disconcerting. I would return due to location, but do hope that management viewing of reviews considers the overall age of the last renewal of this property. We stayed overnight during a trip from Denmark to Austria with our two kids. The hotel is well located very close to the motorway A-9/A-14 cross (though slightly difficult to find as address seems to have changed recently, enter GPS coordinates supplied by hotel). Hotel was good value-for-money, we got a 50% discount on a second double room. Breakfast (optional) was OK, but you might want to take it at a cafe/motorway stop instead. The place was a little difficult to find, set in an industrial area, but once found, it was very good. Our room was very large and well equipped. We did not eat in the restaurant but had an excellent meal in the bar set within the windmill.